You can choose from a variety of packages that reward your dad (or any other man in your life) for being your hero. Is there someone who has made an impact on your life or the life of others? This is the perfect way to honor them. Inspired by Superman and his unwavering morals and endless pursuit of truth and justice, the Superman Hall of Heroes offers a way to pay tribute to real life people by submitting a photo and their story. Depending on your commitment level, you can also send a gift package to the one you are celebrating. 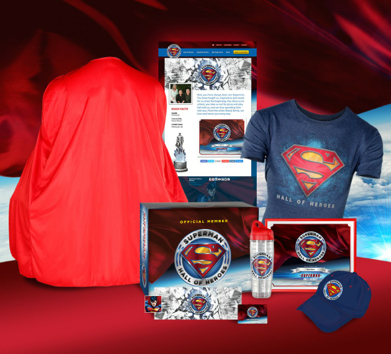 The gift package we gave contained the Superman t-shirt, a hat, a coffee tumbler, and a water bottle in addition to the official documents and box. The Superman-themed items were a huge hit, and I was very pleasantly surprised. British Sterling was originally one of the top 10 colognes of the 1970's. It's making a resurgence now with two new scents that are in the same league with current trendy scents for men. British Sterling Reserve comes in a dashing black and silver bottle. It has a spicy, manly scent that is very sensual. British Sterling Private Stock comes in a silver and white bottle that is very clean and sharp looking. Crisp scents of cypress and cedar highlighted by lime and juniper make this scent invigorating. The background of amber and incense deepen the intensity. I gave a bottle to each of the men in the house and they loved them . . . and, between you and me, they're both hard to please so this is quite a success. Keep watching because there is a giveaway coming for a bottle of each of these scents later this week!